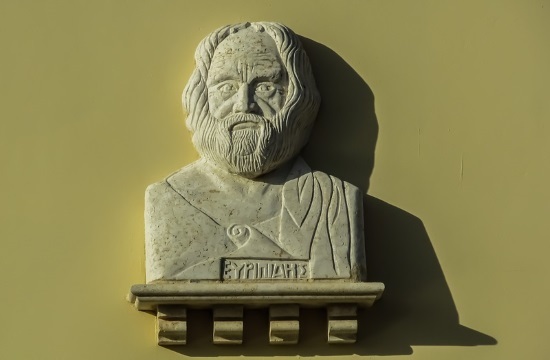 NEW YORK – Written in 412 BC, the ancient Greek tragedy Ion by Euripides narrates the struggles of the first King of Athens. The play comes to The Tank, 312 West 36th Street in Manhattan, for three performances April 25-27, in a new translation and direction by renowned Greek director Ioli Andreadi. The show will be presented in Greek with English supertitles. A young theatrical auteur, Andreadi has written and directed 28 performances so far, inspired by the works of Artaud, Moliere, Repin, Shakespeare, and Sophocles, in major festivals and theatres in Greece, the UK, Germany, Italy, and New York. Her credits include: a Fulbright for Artists/Masterclass at City Center Studios on Ancient Tragedy and Musical Theater and serving as Co-Artistic Director of World Wide Lab, Irondale Center. She is also a Member of the LCT Director’s Lab, with the sponsorship of the Stavros Niarchos Foundation. Andreadi has translated Ion from the ancient Greek and directed a cast of three exceptional performers: Konstantinos Bibis (Award for Best Young Greek Actor 2017) who comes to New York for the second consecutive year, after taking part in The Birds performed last spring at St. Anne’s Warehouse directed by Nikos Karathanos; Dimitra Chatoupi, outstanding Greek actress and Artistic Director of one of its leading Drama Schools; and, finally, world famous percussionist Nikos Touliatos. The show, a performance of Ion for just three performers, inaugurated the first International Laboratory of Ancient Drama that took place at the ancient theatre of Philippi in Northern Greece in summer 2017, produced by the National-Regional Theatre of Kavala and by the Philippi Festival. Since then, it is touring Greece with great success. In late 2018 it was the first show in history to receive honorary permission to be performed on the Slopes of the Acropolis Archaeological site. The Tank is the show’s first stop in its world tour, to be followed by performances in Puerto Rico. Young Ion – who will become the founder of Iones, aka the Athenians – arrives onstage while Creusa is seated in the auditorium, among the spectators. The hero is charmed by the foreign woman, feeling a strange connection to her. According to the myth, years earlier, Creusa, daughter of the King of Athens, got pregnant despite her will by the god Apollo and, after nine months, gave birth to a son, in secret, alone and without any help. Out of fear and respect towards her family, she decided to abandon the newborn inside the very same cave where she met the god Apollo. Under Apollo’s command, the god Hermes transferred the baby to Delphi, the navel of the world, so that Apollo’s Priestess raised him in his Temple. The child grows up eating the offerings people bring to the god and, when he is a teenager, he becomes the Guard of Apollo’s Temple. A few years later, Creusa visits Delphi together with her husband, in order to ask the Oracle why they cannot have children. So Creusa and Ion, mother and son, meet. Is this tragedy a propaganda? Is it the poet’s attempt to invent a godly origin of the Tribe of Iones and, therefore, the Athenians, in order to justify their claim to rule the whole Aegean Sea? In Ion what seems is not what is. You cannot see clearly what is real; it has to gradually manifest itself. Turning the invisible visible, making the hidden, coded and mystical elements of the play appear (“Now you see what you should see”, a leitmotif common in both Oedipus Rex and Ion, relating back to the Mysteries of Eleusis) and, finally, composing a clear story on stage that brings to light what is being implied, hidden or silenced, is the central aim of the new production. The new translation of Euripides’ Ion by Ioli Andreadi was published by Kapa Ekdotiki in 2017. Musician Nikos Touliatos provides live accompaniment for the actors. The shows are at 8 PM on April 25, 26, and 27. Tickets are available online: https://www.brownpapertickets.com/event/4101569.